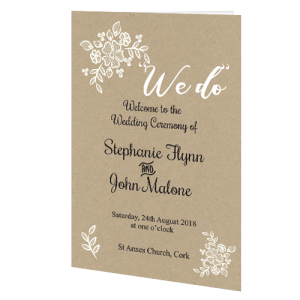 The Ceremony booklet also known as order of service booklet or wedding mass booklets inform your guests of the marriage ceremony details and also list the names of your wedding party. 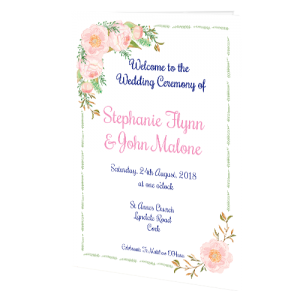 Weddingcardsdirect can do a range of sizes of ceremony stationery from ceremony booklets to pamphlets also known as tri-fold ceremony booklets to single sheets called scrolls. 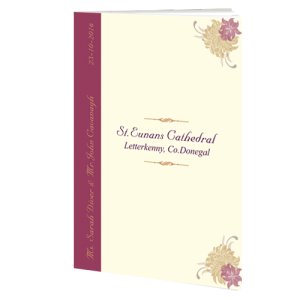 Wedding mass booklets are a lovely way of letting your guests know who is in your wedding party but also explain the running order of the ceremony including songs and music, readings and who read by. Also, ceremony booklets prompt your guests to respond back to the priest or celebrant at the appropriate time and also give them an idea of the running order of the ceremony. 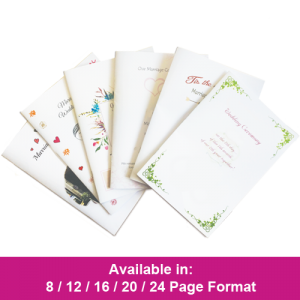 Basically a ceremony booklet or wedding mass booklet is an essential part of your wedding stationery after the wedding invitation. 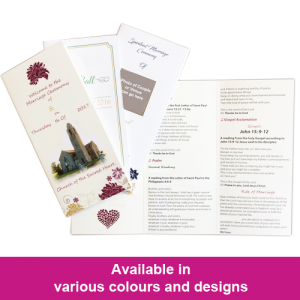 Additional information can be added to your wedding mass booklet to reflect your personalities such as poems, quotes, verses, photos or images. A Thank you piece to your wedding guests and parents at the back of the mass booklet is always a lovely thoughtful touch. Our design team at weddingcardsdirect are ready to work with you to create your very special mass booklet and create a truly lasting memento of your wedding day. 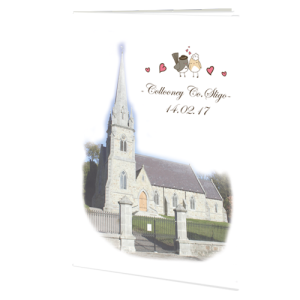 Most Irish couples choose to pay tribute to their loved ones passed on by including them in their wedding mass booklet. The wording for remembering loved ones passed on can be a sensitive one. At weddingcardsdirect we have some sample sentences to inspire you to complete your wedding mass booklet for your joyous day. Never to be Forgotten: ‘On this joyous day, we remember those loved ones who could not be with us. We feel your presence in our hearts’ or We Remember: ‘On this day of our marriage celebration, out thoughts are also with our loved ones who have passed on and could not be with us to celebrate. May their presence grace out hearts today, and every day of our marriage’.